The gas barbecue grill Elite models by OCI were truly exceptional gas grills with tremendous longevity and legendary design features. Unfortunately the stability of the company did not last and these awesome grills did not remain in fabrication for even a decade. The video instructions below demonstrate how to remove the control panel from an Outdoor Concepts, Inc. gas barbecue grill. 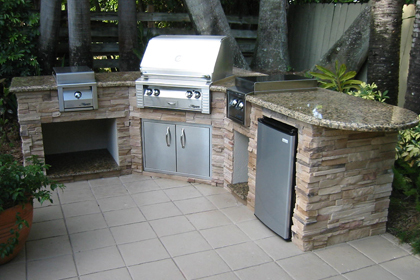 The OCI gas barbecue grill Elite models include the E36 and the E48 which both integrate a pressurized infrared burner at the far right side of the grilling surface. Infrared gas burners will typically heat above One Thousand Degrees inside Two Minutes! Grilling at searing temperatures is what these are made to do. The U burners in an OCI gas bbq grill are also able to be very hot and these U shaped burners have heavy stainless steel rod trays installed above the burners so the convectional heat coupled with the conductive heat radiating off these all stainless rod trays in enormous has the ability to grill above restaurant-quality searing temperatures even without the infrared burner. However, the OCI Elite models also have a smoker and a rotisserie with their own dedicated burners and cooking system accessories. These OCI gas barbecue grill models were made to be fully capable of every and any kind of cooking style and at any type of temperature type and temperature level. Of course the goal of this particular post is not to be a cheerleader for OCI grills but showing the information in the video tutorial above. OCI Control Panel Design Does Not Seem To Have Any Hardware Holding The Control Panel In Place. The OCI Elite models control panel always had a nice clean appearance without bolts or screws at the four corners. There are no visible means of production across the control panel. Only when we need to repair something or access the control area for some reason do we realize we need to understand how the control panel is removed — and removed properly. Inside The OCI Control Panel We Can See The Rotisserie Controls, Burner Valves, Ignition Assembly, Gas Manifold, and Access Anything Necessary To Repair The Grill Or Adjust Performance. As we will have seen in the instructional video shown above, the lower drip tray slides completely out so we are able to look up inside the control panel and realize each far side of the control panel has 3 bolts holding each side in place — this is a Lot when compared to other gas grills and is really a bit much when the overall design makes to seem as though there is no hardware at all! Six Bolts holding the control panel in place! Fortunately, as shown in our tutorial video above, we really only have to actually extract the very lowest left and the lowest right side bolts. Once the lowest left and right side bolt is removed from under and behind the control panel — easier typed than accomplished but not too bad I promise — the rotisserie button and the rotisserie bezel Must Be Removed with the control knobs. Now suitably naked, the control panel will shift about a half-inch up and slide out of the front of the gas grill. Try to keep the left and right side even so the cut-out “L” shaped slot does not get caught with tension from one side getting too far ahead. It is possible to keep the control anel perfectly straight and level by sliding up and then sliding out the lower bolt before the higher bolt which is how we pull the control panel out in the video. Once the control panel is free the only resistance will be determined by the length of the momentary switch button wires which simply pull free. Previous post: Replace OCI U Burner To Repair E36 and E48 BBQ Grill Models. 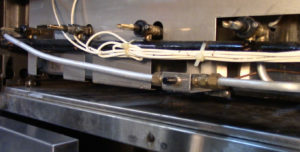 Next post: Rotisserie Valve Keeps Turning Off Burner – Explanation Repair and Use.